We have been doing beach house rentals for many years and just added this amazing property. 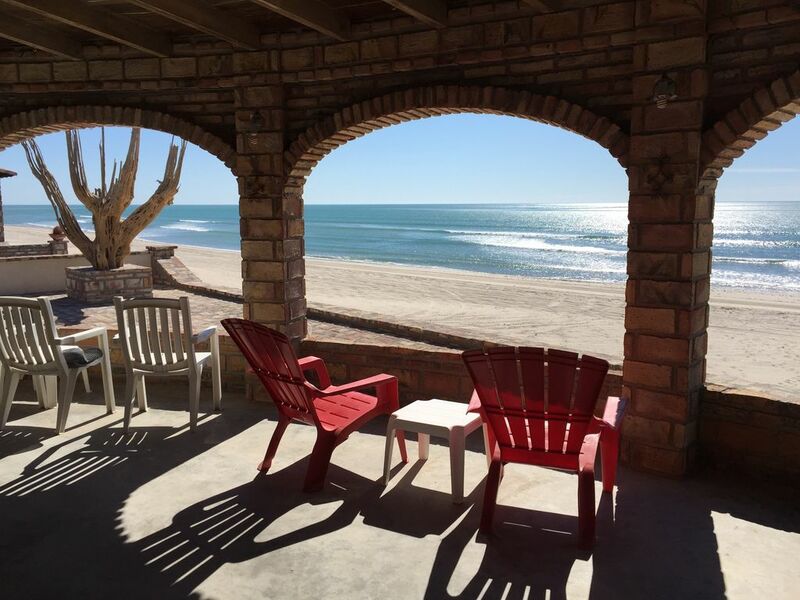 Our Mexico beach house has Wi-Fi and is located in the South Campos of San Felipe at KM 31.5 approximately 20 miles south of the town of San Felipe in an enclave of custom beach front homes. Only a 2-1/2 hour drive south from the California border at Calexico/Mexicali. Description: Solar powered Off Grid ECO beach front Villa living at its best. The house sits on a premium 100ft wide beach front lot. The house has an easy relaxed vibe with amazing views everywhere you look; from the amazing sunrise over the Sea of Cortez to the sunsets over the Desert Mountains to the star gazing at night. We fell in love with this beach spot over 30 years ago and it was our dream to someday have a house here. We have had this house for 10 years and have decided to share this amazing place with guests. If you are looking for an incredible visit to Baja, the real Baja where the sea of Cortez meets the desert this is the place. You will feel like you are a million miles from home and it’s only a 2-1/2 hour drive from the border. The property has an amazing unique Mexican architecture with an arched veranda that wraps the entire front of the house. Sweeping beach and ocean views from every room. It features approximately 3000 square feet of comfortable living space with 2 beach front bedrooms each with king beds. Plus the house also has a loft and game room. The loft has one king bed and a twin bed and the game room has a double futon. The house has 2 full bathroom one on each side of the house. A covered beach front veranda surrounds the front of the house. This is a perfect place to hang out and relax. Plus there is also about 2000 square feet of outdoor patio space so you can easily sit in the sun or in the shade. We are very fortunate to have wonderful caretakers to take care of our guests. The house will be opened up, cleaned and inspected prior to your arrival to ensure a great experience. We have had the same people taking care of this enclave of custom beach front homes for the past 10 years. We have been HomeAway.com vacation rental owners for many years with many great reviews of our properties. See our other listings and reviews in Newport Beach California. Listing property Id # 941717 & 296084. All of our properties consistently receive 5 star reviews and we a Premiere HomeAway Partner. We love beaches and traveling. We have been vacation rentals owners for a few years and just decided to share our favorite beach house with guests. Our other properties are in Newport Beach CA HomeAway property id # 296084 & 941717 please see our reviews! We also just added a second Baja beach front home in the same enclave. Baja Beach Front Getaway property Id # 4903685 2 bedroom 2 bath and accommodates up to 4 guests. Rent both houses. Great way to have multiple families all at the beach! We have been traveling to Baja for 30 years and fell in love with this property and its location. It's an amazing place. We get to spend some great family time when we go there and completely unplug. It is one of my favorites spots in the world. The review below says it all, as to why this is such a magical place. "We have been fortunate enough to stay at this amazing property many times. Our family has been going down to this part of Baja for over 20 years. Our friends stayed in the other home in the neighborhood, so we had a fun group. The house is very spacious with two large bathrooms. Both bedrooms are identical masters and have sliders that look out onto the beach. There is something very special about watching the sunrise over the Sea of Cortez - every morning is magical! We had perfect weather with amazing beach days. Lots of kayaking, SUPing , Beach walks and relaxing. The highlight of the trip was watching baby sea turtles hatch from their nest and make their journey to the sea. This happened on four consecutive mornings about a third of a mile north from the house - we had never seen this, so a bucket list item for sure! The entire week was magical! Can’t wait to go back! Thanks so much Joe!!!" Very Private in an enclave of customer beach front homes. Amazing Beach Front Villa with wonderful sunrise and sunset views. Right on the best beach in San Felipe. Off grid ECO friendly solar powered home with Wi-Fi. The bathrooms are on each side of the house by the bedrooms. Beautiful wood burning fireplace. Please bring wood if desired. Upper deck great place to watch the sunset. It is off of the loft. Right on the ever-changing Sea of Cortez. A great beach for walking, shell collecting, swimming (a little chilly in January but still swimable), paddle boarding, kayaking and just watching the sea and desert! Be sure to bring your binoculars!! It is a full half hour south of San Felipe, so don’t expect to head there for nighttime fun. Perfect for a family group who can entertain themselves or anyone that wants peace and quiet. Thankfully, just three miles away, there are two very good restaurants & a store that had everything we needed for our month-long stay except meat/seafood, so you’ll want to stop in San Felipe for the super fresh fish & shrimp. We enjoyed our cocktails watching brilliant sunsets, coffee with gorgeous sunrises. It is a daytime place for sure, although the star gazing was great too. As for the house itself, water is pickup-trucked in by the friendly caretaker Alfredo and it has off-grid solar. Thus, it is glorified glamping with very comfortable beds, hot showers and a lovely fully functioning kitchen. Joe and Alfredo were very kind, responsive and accommodating! We had a great stay in San Felipe. Home was perfect and clean. We enjoyed the kayaks and stand up boards and patio furniture. Beds were comfortable. I only wish there was an oven and a microwave. Otherwise we were very comfortable! The house views are amazing. It’s right on the beach. Great directions from Joe as to how to get to Felipe and house directions. Paddle boarded everyday. Weather was perfect. Alfredo the caretaker was very nice. I would highly recommend it. Will be back. Perfect getaway vacation. Everything as advertised! Window and door screens need attention. Beautiful location. A lovely experience. Our week here flew by! We had an amazing time and the house was adequately equipped. The view was amazing and I was able to bird watch from the porch. I was also able To see the kids playing in the water From any room in the house. Amazing! It was great to explore the tide pools and we even had the incredible experience of freeing a dolphin trapped in a ghost net near shore. (Sad he was trapped, glad we could free him!) Aside from the heat (I think our week just happened to be the hottest week of the year? ), this was a perfect vacation and we will definitely be back (just not in July, hah)! The caretakers were Very helpful and Joe (the owner) was very responsive. My children were taking about “the next time we come” the entire trip. Thanks for everything!